Singapore’s housing market is likely one of the most affordable of any major developed city in the world, said a recent research by JLL. The report which said that Singapore’s housing market is leading the pack among the global housing market and added that there seems to be limited downside risk to investing in the Singapore residential market now, whether for owner occupation or long term investment. The report highlighted that home prices have become unaffordable around the developed world as a consequence of excess liquidity and low cost of debt over the past 15 years or so and that home prices rose much faster than the increase in household incomes. “Governments around the world have recently responded to escalating home prices by introducing measures to reduce demand and curb price escalation. Home prices have started to fall in some markets but aligning home prices to incomes could take a number of years. In our view, it is likely that governments will keep in place the measures they have introduced for some time to come. Rising interest rates will also have a place to play in cooling price escalation as borrowing becomes more expensive. The report said that Singapore’s housing market largely stayed out of this conundrum because the policy makers acted by introducing measures to cool its housing market since 2010. This policy stance, together with a very sound and successful affordable public housing policy, has made Singapore’s housing market likely one of the most affordable of any major developed city in the world, it added. The Singapore government has since 2010, introduced a series of property curbs to cool Singapore’s housing market and to prevent cost of living from becoming too prohibitive for its citizens. Coupled with increasing supply and weaker sentiments, prices in Singapore’s housing market are likely to moderate or remain flat from this year going forward. 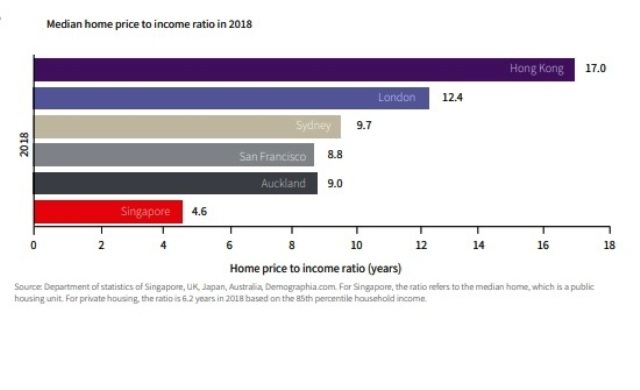 Another recent research pointed out that property prices in Singapore are still relatively affordable compared to those in top-ranked Hong Kong and our average price growth over 2018 is one of the lowest compared to the other 34 cities in this study. “• Stability and low volatility: We expect limited downside as prices in the Singapore residential market have not been allowed to escalate for the past decade and to the levels now seen in other major developed cities. Private residential median prices are affordable at about 5 years of median income. Price volatility in the last 10 years is low, compared to other gateway cities. • Supply is moderating: While housing supply grew by 3-4% p.a. in the past five years, upcoming housing completions are lower, growing at less than 2% annually in 2019-2020. With less supply, a reduction in existing stock due to collective sales and growing demand as the employment market grows, we expect rents to trend up, helping to support price growth. In particular, upcoming supply in the prime districts is lower in 2019-2022, growing by less than 1% p.a. • Stable returns expected: The government is likely to continue to manage prices to ensure they track income growth of 3-4% annually. While relatively modest, this is a stable return. In the last 20 years, both residential prices and household incomes have grown by 3-4% CAGR. • Solid currency to be invested in: Singapore has highly competitive exportable goods and services and her foreign reserves are one of the highest in the world at over USD 52,000 per capita. As a result, the Singapore dollar has been resilient, appreciating against the US dollar by 20% over the last 15 years. The post Singapore’s housing market most affordable of any major developed city in the world appeared first on iCompareLoan Resources.